All across the nation, trucks may lose items from their unsecured loads causing obstacles on the road that other drivers must swerve around. When this extreme driving action results in an accident, it might be possible to hold the liable party financially responsible for any damages or injuries. Washington state laws require "the operator of a vehicle transporting solid waste to a staffed transfer station or landfill to secure or cover the vehicle's waste in a manner that will prevent spillage." Furthermore, these laws state: "No vehicle shall be driven or moved on any public highway unless such vehicle is so constructed or loaded as to prevent any of its load from dropping, sifting, leaking, or otherwise escaping." (RCW 46.61.655). Regulations for securing loads on log trucks, in particular, are very detailed in Washington. Contact us at 206.624.8844 for diligent advocacy from seasoned personal injury attorneys. Can laws such as these be applied to your car, truck or motorcycle accident caused by falling debris on a street or highway in Washington? 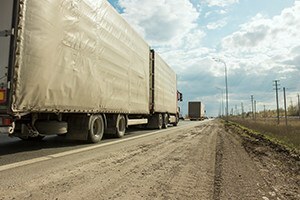 Violation of trucking regulations may mean that there was negligence on the part of the truck driver and/or other parties such as the trucking company, a loading dock operation or a truck manufacturer. At Kraft Davies, PLLC, our Seattle unsafe load accident lawyers understand the hazards that can be caused by items on the roadway. If you or a loved one was injured in an accident when a truck's load unexpectedly spilled into your driving path, it is important to seek the counsel of an experienced lawyer. Our firm has the legal knowledge and the trial skills necessary to guide you to a successful resolution. These are examples of scenarios that can lead to an unsafe road and the potential for serious accidents and injuries. If you were in a motor vehicle accident caused by items falling off of trucks, it is important to hold the responsible party accountable for its actions. For more information or to schedule an appointment with an experienced personal injury lawyer regarding accidents caused by unsafe or unsecured loads, please contact us.